Get your teeth whitened in Cheshire by Freedom Dental. We offer four different tooth whitening systems to cover every budget, and we're an accredited tooth whitening centre of excellence based in Cheadle Hulme, Cheshire. We are proud to offer the safest and most effective tooth whitening systems using trays and gels at home. Our range of well known tooth whitening systems have been carefully chosen to offer a wide choice depending on your budget. From the British made Sparkle Professional Tooth Whitening Kit to the mid range Pola Advanced Teeth Whitening System. We also offer the top of the range Enlighten Professional Teeth Whitening System, which is the only system to guarantee shade B1 whitening. Tooth whitening is not just for celebrities, in fact whitening is one of the most popular and requested cosmetic dental treatments in Cheshire and throughout the UK. Everyone is entitled to a sparkling, healthy smile, that’s why we offer tooth whitening at an accessible and affordable price. This British made whitening smile system uses gels, which can be used either in the daytime or overnight for an unbeatable price of just £295 for the full kit. This high viscosity, neutral ph tooth whitening tray and gel system ensures the greatest patient comfort in a take home whitening kit. The unique blend of soothers, conditioners and high water content assist in reducing sensitivity and the formation of plaque and tooth decay. This Australian produced tooth whitening system can be used for as little as 30 minutes a day, or even overnight while you sleep at a cost of only £295. Enlighten is the gold standard of tooth whitening and the only whitening system in the world to guarantee a shade of B1 ( that’s really white !) 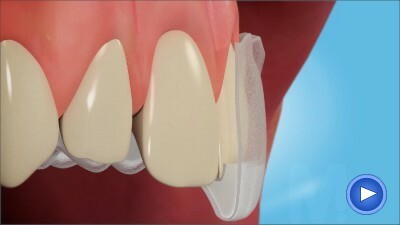 Again this whitening system can be used day or night and begins with impressions in the dental surgery. You will be sent home with a toothpaste called Enlighten Tooth Serum, which is to be used twice a day instead of your regular toothpaste. This is no ordinary whitening toothpaste. It contains a material called Hydroxyapatite (HAP) which is what your Enamel is made of – 97% of it in fact! This HAP will not only improve the tooth whitening effect, but it will also protect your teeth and reduce any sensitivity. After 2 weeks you will return for fitting of custom made superior quality sealed teeth whitening trays and be given a demonstration of the system. 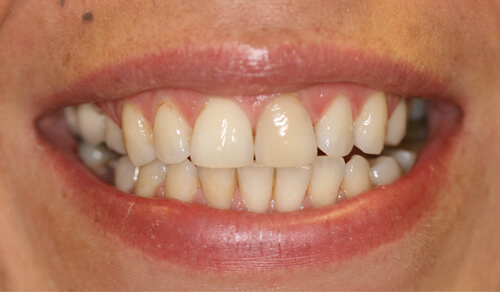 We will take photos of your current tooth shade and then invite you back after 2 weeks for further photographs, so that can see the dramatic transformation. We can even email you these photographs if you like. All this for only £395! For those looking for the best tooth whitening result that money can buy we recommend using the Enlighten Home Whitening system in conjunction with a 40 minute in surgery boost session. After 2 weeks of whitening at home you will return to the practice where the dentist or hygienist will safely use your existing whitening trays to further whiten your teeth using stronger gels. This final treatment will not only boost the colour a little, but will ensure the teeth whitening is even and natural looking and help the colour to be more stable i.e. the whitening will last longer. 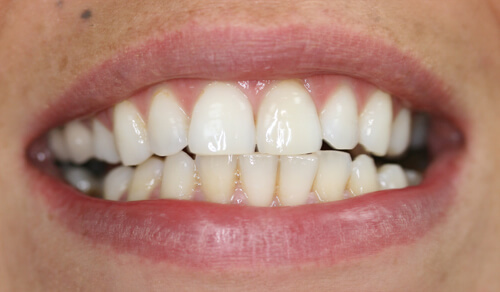 A Hollywood smile for only £595! Who can have teeth whitening treatment? Tooth whitening is available to anyone over the age of 18 who has had a full dental check up to ensure the teeth and gums are healthy. Whitening can be performed on pregnant women and it will not change the colour of crowns, bridges, veneers and fillings. These will need to be changed by your dentist after the treatment to match the new shade of your natural teeth. Patients with sensitive teeth should consult with their dentist prior to considering tooth whitening as some people find the process to be a little sensitive on the teeth. This can be severely reduced by using special toothpastes and whitening gels with desensitisers in them. It is now possible to have white teeth for life as the custom made trays can be kept forever and be used to whiten for 1 day or night every other month. Ask your dentist about supplying top up whitening gels for this. Tooth whitening comes under the practice of dentistry and should only be performed after you have been given a full check up by your dentist. Tooth whitening is regulated by European laws making dentists, which are the safest people to perform the procedure. Tooth whitening provided anywhere else is illegal and can result in prosecution. How do I start my whitening procedure? Before we even begin teeth whitening, you will need to contact our practice and book an appointment with the dentist for a full dental examination. At this appointment, if you are found to be appropriate for whitening, you will have the impressions taken for the custom made whitening trays. New and existing patients can call or email the practice, or for an even easier way new patients can book their tooth whitening appointment online now! Complete our enquiry form below and we will be in touch shortly to discuss the best teeth whitening option for you.